December is a good month to look out for this shore bird on Arran. 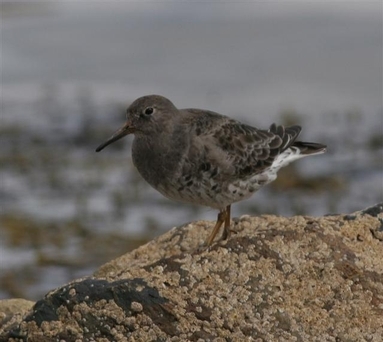 Although there is a very small breeding population of the Purple Sandpiper in the north of Scotland, this is a bird with the most northernmost range of any shore bird, extending past the Arctic Circle to Franz Josef Land and stretching from the Taimyr Peninsula in Siberia to eastern Canada. On Arran it is a passage migrant and winter visitor, with most records in recent years from December through to early April. These birds enjoy the wave washed intertidal zone on rocky outlets feeding on small molluscs and often sharing this niche with the more common Turnstones. A good time to look for them is as high tide is approaching, when feeding areas become smaller. Most of the recent records for Arran have been from shores on the south and west coast. Although there is very little purple about Purple Sandpipers, other than that their slate grey winter plumage has a faint purple gloss in some light, their presence on our shores brightens a dull winter day.